Artist Isaac Levitan was considered one of 19th century’s best landscape artists in Russia. He was a member of the “Itinerants” group and he’s popularly known as the creator and developer of “atmospheric or mood landscape.” His landscape paintings were characterized by his excellent mastery of light, shade and color. But while it is crucial to his painting composition to capture the light that way he saw it, just like it was for Sisley and Monet, Levitan was more a Realist than an Impressionist painter. He was dedicated to plein air painting and naturalism and was naturally gifted at rendering an unusual number of natural views, the different times of day and the four seasons. Some of the major influences in this painting style were Vasily Perov, his teacher and the works of the landscape painters from the Barbizon school and the works of Camille Corot. 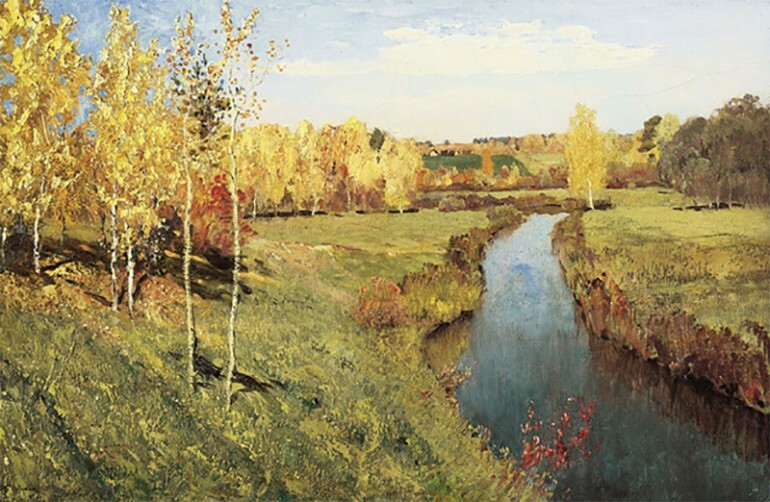 Some of Levitan’s famous landscape paintings include “Birch Grove,” ”Spring Flood,” ”Golden Autumn,” ”Vladimirka” and ”Secluded Monastery,” which were all bought by a single patron, Pavel Mikhaylovich Tretyakov, and which are now in the collection of the Tretyakov Gallery in Moscow. Levitan was very active in the artistic community and had regular exhibitions at the Munich Secession, World of Art and was a lecturer at the Moscow School of Painting. He also frequently participated in the activities of the Moscow Club of Literature and Art. 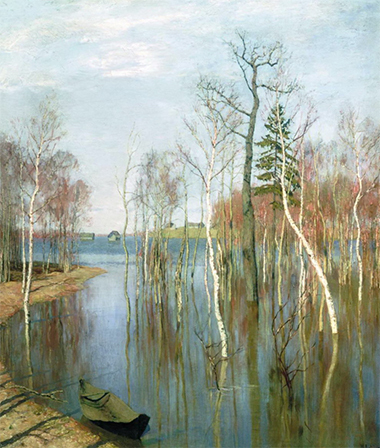 Isaac Ilyich Levitan was born on August 30, 1860 in Kibarty (now part of Lithuania). They were a poor Jewish family but they were well-educated. His father was a rabbi who also taught French and German in Kowno and became a translator for the French construction company that was building a railway bridge in Russia. His family moved to Moscow when he was 10 years old. A month after he turned 13, he enrolled at the Moscow School of Painting, Sculpture and Architecture. For one year he was in the copying class before he went into the naturalistic class and later into the class in landscape painting. Some of his teachers were Vasily Polenov, Vasily Perov and Alexei Savrasov, a very prominent Russian Impressionist painter and inventor of lyrical landscape painting. His mother died in 1875 and his father followed after two years. Levitan’s family became poorer. Aside from having Jewish origins, he was given a scholarship to keep him in school and because of his achievements and talent. He garnered favorable media recognition during his first public exhibition in 1877. Due to unfortunate circumstances, his family and fellow Jews were forced to move to Saltykovka in 1879. Because Levitan had many followers and patrons, Russian officials allowed the artist to return. His painting called “Autumn Day. Sokolniki” was bought by art collector and philanthropist Pavel Mikhailovich Tretyakov. During his student days in the Moscow School of Painting, Sculpturing and Architecture, Levitan became friends with painter Nikolay Chekhov, architect Fyodor Shekhtel and other artists like Mikhail Nesterov and Konstantin Korovin. Nikolay Chekhov’s brother, author Anton Chekhov, became Levitan’s life-long friend. He collaborated with the Chekhov brothers in the early part of 1880 on Moscow, an illustrated magazine, as well as illustrations for M. Fabritsius edition of the book, Kremlin. He also collaborated with Korovin in painting the background scenery for Savva Mamontov’s Private Russian opera. Vasily Surikov, Ivan Kramskoy and Ilya Repin to organize the Itinerants (The Wanderers, The Association of Traveling Art Exhibitions) to mount events across Russia. Levitan was not enamored with urban scenery and preferred rural scenes of meadows and woodlands where he can show his appreciation of nature. This was where he showed his deep understanding of sympathetic colors, linear perspective and light. It was likewise all right for him to introduce symbolism in some of his compositions, but he was definitely a naturalist and just like Corot, a painter of mood landscape. He often painted simple scenes typical of his country but injected his unusual ability to invoke deep human feelings in his landscapes. He created over one thousand watercolors, oil paintings and other art works throughout his careers, many of them seen in some of Russia’s best art museums.